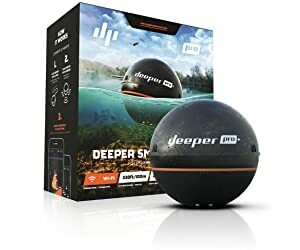 8 Best Kayak Fish Finders 2019 - Portable or Not? 8 Best Kayak Fish Finders 2019 – Portable or Not? Tired of casting your rod out of your fishing kayak, praying to get even the slightest hint of a bite? We remember those days. Luckily, there’s a handy little tool you may know about, aptly named the “fish finder”. It would be easy to think that all fish finders work the same; however, with a recent rise in fish finding technology, there are many different options for finding fish to suit your fishing habits. To help narrow down these options, we’ve compiled a list of the 2019 best kayak fish finders. We’ll help find the one for you, so you can focus on landing your big catch! 3 Which Unit Should I Choose? When kayak fishing, there are a few factors to consider in your search for a great fish finder. Additionally, most kayaks will not come pre-loaded with a fish finder, in which case, you will want a portable fish finder for your activities. Portable fish finders offer more variability – if you don’t like the stock fish finder on your boat, you can easily swap it out for a portable one! Portable fish finders are – wait for it – portable! Take it to the river, off the dock, ice fishing…the possibilities are endless! Some portable fish finders will sync up to your smartphone, making it more convenient and keeping your tackle box light! Portable fish finders are ultimately beneficial in helping you locate fish wherever you are – but for kayak fishing, the results are tremendous. While the Garmin brand name is enough to earn a second glance, their Striker 4 Fish Finder lives up to all the brand hype and more. It features an extremely user-friendly interface, with a full-colored 3.5″display screen, CHIRP sonar, and sharp 77/200 kHz transducer. 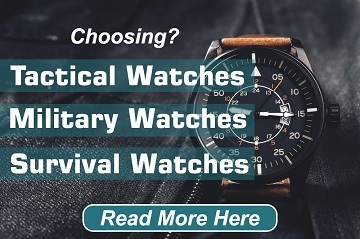 It also comes with a built-in GPS, which allows you to set waypoints, navigate routes, and mark different structures such as dropoffs, rock piles, or any underwater obstructions. The Striker 4 fish finder comes with a dual display ability to set two screens side-by-side. This allows you to easily view your waypoint map and reader in the same display, or to view both the 77 and 200 kHz signals together for a fuller underwater reading. At an extremely low price point, the Striker 4 steps up to the plate and delivers most of the features we loved in the higher priced options. This is one of the most popular models for beginners and seasoned anglers alike, and we can easily see why. The HawkEye Fishtrax 1C Fish Finder has recently become a popular option for fish finder, and is one of our personal favorites. 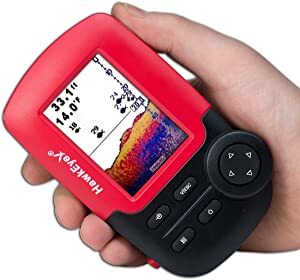 About the size of a smartphone, this fish finder easily fits in the palm of your hand, and comes with floatable, troll-able, and boat mountable transducer, making it ultra portable. The Hawkeye Fishtrax 1C is comparable to the Garmin Striker 4 in size, function, and metrics. It features an 83/200 kHz transducer, 100-level sensitivity adjustment, and auto-zoom bottom tracking for you to fine-tune your reading to either shallow or deep waters. The key to this fish finder is in its simplicity: it has 3 user-friendly modes that give you a quick and concise reading for when you need it. Specifically, the Ice Mode’s digital flasher makes this product perfect for multi-season use, including ice fishing. If you’re still not convinced, HawkEye stands by a 2-year warranty to assure that you love their product as much as they do. The Signstek FF-003 is a great low-priced option for those looking for a simple, reliable fish finder. It has an LED sunlight readable display, and is very easy to operate, much like the first two options. While the Signstek fish finder may not look as sleek as some of the other options, it is an internal work horse. It has a depth reading from 2.0 feet to 240 feet, which is perfect for the average fisher, even from a kayak. It has a 100-level sensitivity adjustment and multi level depth range, bottom contour and water temperature indicator. The Signstek also has an 83/200 kHz sonar frequency and comparable average battery life to the first two options. Overall, this makes for a great option for kayak fish finding. The Deeper Smart Sonar Pro+ is the perfect option for those who want a superlight, portable, and wireless (yes, wireless) option. The Deeper Smart fish finder seamlessly weaves fishing into a smartphone/tablet interface, without being tied to it. And for those without an iPhone/Android, don’t count yourself out – they work on all platforms. The Deeper Smart Sonar Pro+ is truly a portable fish finder. While the battery life is not ideal – 5.5 hours on continuous use – its other features make this a strong contender for best fish finder. It floats easily in fresh and salt water, and gives a strong layout of the bottom. At its core, the Deeper Smart fish finder was made to help find the best fishing spots. 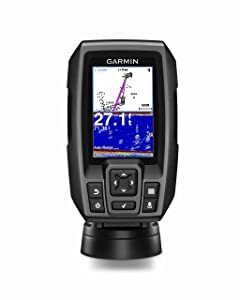 The most unique feature about this is your ability to tie the fish finder with fishing line, cast out, and receive a scan of the whole area between you and the end of your line. This will allow you to see in what direction to cast, how far out, and how deep the fish are in a certain vicinity. This feature alone absolutely makes the product worth it for us. For those looking for smaller add-ons, the Deeper Smart Sonar Pro+ app comes with a fishing log, diary, and maps. Overall, this is a great option for those looking for a newer take on fish finding. It uses technology to its advantage to enhance the fishing experience, and functionally operates just as well as any of the traditional fish finders on our list. The Humminbird Fishin Buddy 140c is unlike any other fish finder we have on our list. It is ultra portable, with the ability to use on a kayak, boat, dock, or float tube. There are no screws involved, as it uses an easy and secure clamp mount to fasten the transducer and display to the anchor of your choice. This model has a 200/455 kHz sonar frequency, which gives an extremely clear reading over other models. It goes up to a depth of 240 feet and has a 30 hour battery life as well. The display comes in black and white; however, this did not affect our performance, as the screen was sunlight readable and a decently large size of 3.5″. From our experience, the Humminbird Fishin Buddy 140c is the perfect fish finder for those looking for an extremely portable option, without having to rely on wi-fi or smartphone integration. 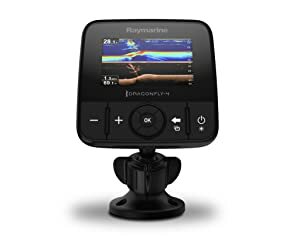 The Raymarine Dragonfly 4 Pro is the largest model in our list; however, it is by far the most functionally impressive of the choices in our list and we just had to include it. Let’s talk display first: it features a 4″ high-definition LED backlit all-weather display, but also comes in 5″ and 7″ models for those with larger boats. It showcases high contrast and color screen, as well as an anti-fog binding. Internally, it gets even better. The fish finder features a wide-spectrum CHIRP DownVision and traditional CHIRP sonar. The first builds an extremely detailed and clear resolution imaging, and the second allows for an unmatched deep water performance of up to 600 feet depths. Raymarine also features an app (aptly called Wi-Fish) to stream live sonar data via a smartphone. This app impressively lets you pause, zoom and rewind sonar data on any smartphone or tablet. It also incorporates a social element that allows you to showcase your prize catch over your social networks! Simply put, the Raymarine Dragonfly 4 Pro has all the features that would entice any angler to make the purchase. Vexilar had a great idea when they developed the idea for their product: turn your smartphone into the fish finder. 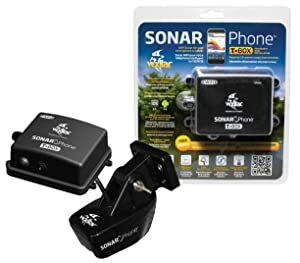 The SP200 T-Box follows through on this idea, creating its own Wi-Fi hotspot to turn your smartphone or tablet into a fully operational fish finding sonar. This fish finder comes with pre-drilled holes, offering many accessories or options for mounting on any kayak. The Wi-Fi hotspot ensures that the Vexilar will work anywhere in the world, and the app is very simple to use. The main draw in this fish finder is surprisingly not the internal features, but rather in the portability of it. It comes with a neoprene arm-band for your phone to spare you the headache of mounting and securing your fish finder every use. With the sonar reaching a depth of 240 feet, water temperature and depth indicator, and audible alarms for fish, the specs aren’t bad either. The Vexilar ultimately is made for quick and easy use, and finds its home with customers who are looking for a very portable smartphone-synced option. 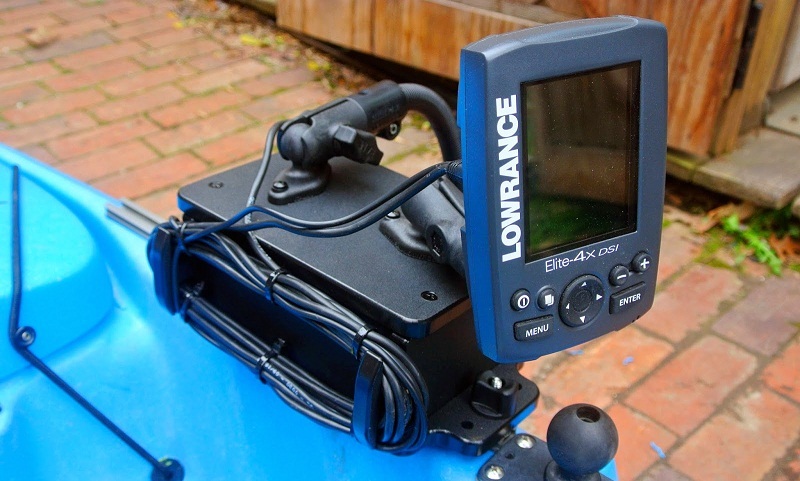 The Lowrance Hook-4 has all the features we love in a fish finder. With a 4-inch display, simple interface, and split screen functions, finding fish with this model is very easy. It features a CHIRP sonar plus downscan, giving it a full picture and stunning resolution on its color display. It has both a 83/200 kHz and 455/800 kHz transducer for ultra sharp image processing, and can reach 1000 feet deep on 83/200 kHz. The Hook-4 also boasts an Advanced Signal Processing (ASP) function, which reduces the need for manual adjustments while trying to find fish. This ultimately allows you to focus on the finding, instead of the fine-tuning. The transducer is extremely easy to mount, and with a display of 4-inches, the Lowrance Hook-4 is large enough to split into 3 screens at a time, without being too bulky to mount in a small fishing kayak. 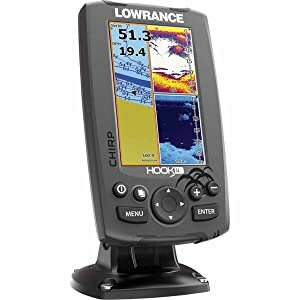 With the built-in GPS and pre-installed maps, this unit is ultimately perfect for those looking to step up their fishing game with a super reliable and very technical fish finder. Out of all the fish finders on the market, which one is right for you? We’ve narrowed it down to a few, but here are our absolute favorites, depending on what you’re looking for. Out of all the fish finders we tested, the Raymarine Dragonfly 4 Pro stood above the rest. It had a nearly unmatched technical ability, and lots of features that made us come back to it over the others. We couldn’t believe the price of the Garmin Striker 4 when we saw what it could do. In ease of use, great features, and compatibility to other Garmin products (not to mention a pretty low price point), we think the Garmin Striker 4 would fit any angler’s needs. Our favorite toy to play with was the Deeper Smart Sonar Pro+, as we really got to scan the area around us before we cast out. This fish finder was integrated flawlessly with our smartphones, and we loved getting to play with the in-app add-ons as well. Ultimately, we enjoyed using all these fish finders on our kayak, and feel that with a bit of skill, any one of these could help you nail the perfect catch. Let us know what you use in the comments below! There are some great Fish Finder to fishing. Really I have never read such an informative article before, I have learned a lot of things about kayak fish finder from this blog post, thanks. It’s amazing. I found this blog so informative and useful. I would like to dedicate this post to all fisheries in North America. Thanks once again such a lovely post, go ahead. I agree with everything you said. 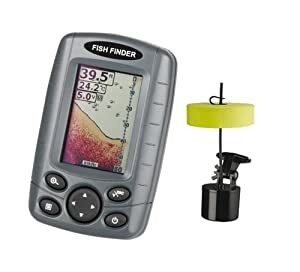 I have recently gotten into kayak fishing and thought this would be a viable option for a fish finder, but it is very limiting. Definitely upgrading. Hi Sammy, i am Martinez.. i am a regular visitor of this site. definitely you have wrote a informative article about Kayak Fish Finders. thank you for your nice article.